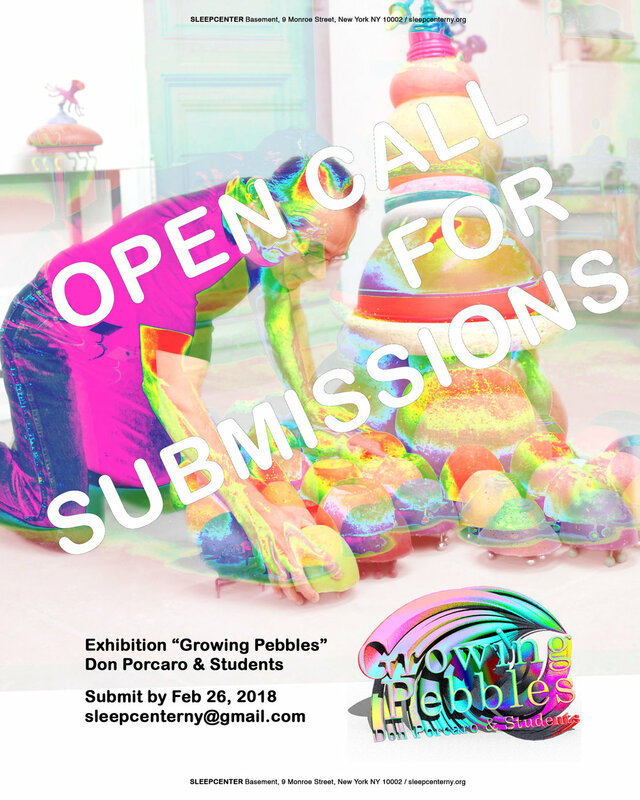 In celebration of Don Porcaro’s 43 years of teaching at Parsons Fine Art, and his lasting influence as an artist and educator, SLEEPCENTER is honored to present “Growing Pebbles”, an appreciation exhibition program, comprised of a solo show of Don’s works, and a group show of Don’s current and former students. SLEEPCENTER is an art space mainly founded and operated by Parsons alumni, with the generous support from Don since the beginning. This exhibition is an opportunity to show Don our gratitude for his commitment to us as students and beyond. We sincerely invite you to join us in saying,“thank you,” for his generosity and tutelage by submitting an artwork of your own, to be exhibited alongside his own works. We are looking for works that carry Don’s guidance or influence. How is your practice inspired by Don’s teaching? In what way have you benefited most from his education? How would you like to say thank you in the form of an artwork? Among your current works, is there a piece that reflects his influence on you? Please bring it to here!